My kids bring me drawings daily, sometimes hourly, to show me love. And I love their drawings, not because they’re masterful works of art, but because they’re from my children. So instead of picking up another toy off the shelf, I’ve decided to return the sentiment by giving my kids some homemade toys. It’ll be made by their dad and, although it won’t be a masterful work of art, I’m sure they’ll love it. Besides, I’m rather confident that anything I make will hurt just as badly when I step on it in the dark. 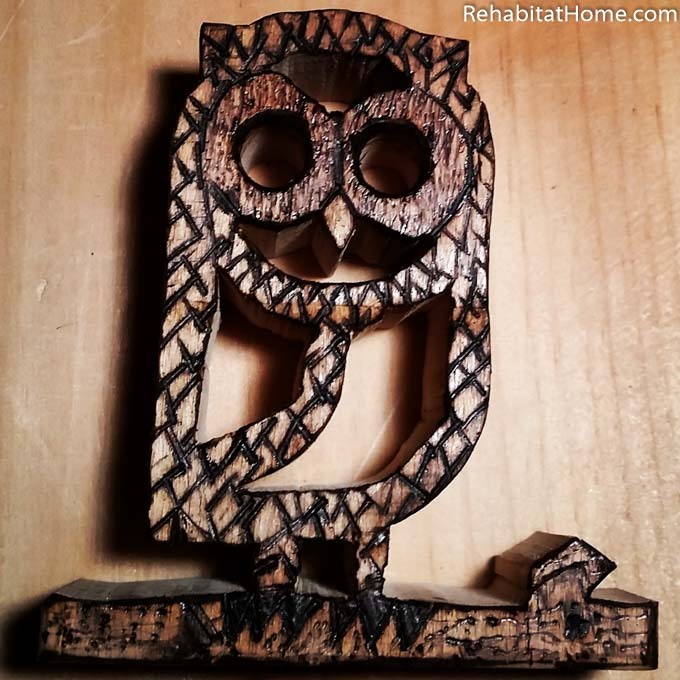 Read along as I describe my first foray into the world of DIY wood animal toys. The first, and most obvious step, is to find an animal silhouette worthy of becoming a wood animal toy. This is not a step to be taken lightly as some animals don’t make good toys (i.e. mole rats). Each of my children has their special animal that they’re infatuated with at any given time which helps narrow down the selection process greatly. Unfortunately, young child don’t recognize my sketches of animals as actual animals (most drawings require a caption like “this is a cat”), so I turn to online resources to help. A great starting place, and the one we used to source the animal shapes for our toys and RehabitatHome t-shirts, is to use the free icon images at The Noun Project. There’s tens if not hundreds of thousands of images and even obscure searches yield hits (i.e. aardvark had 6 hits). Or, if you have any artistic talent or are tech-savvy, you can always create your own animal silhouette or convert actual photos into black and white outlines. Either way, find a good one and print it out on the printer. 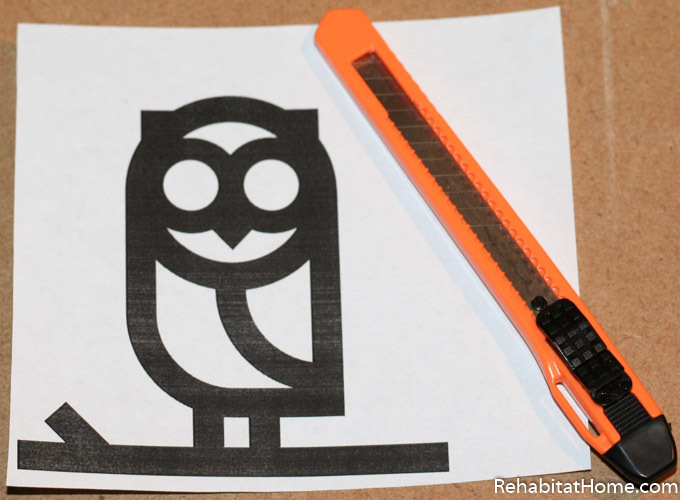 Note that the dimensions of the printed silhouette will directly determine the size of the finished toy. 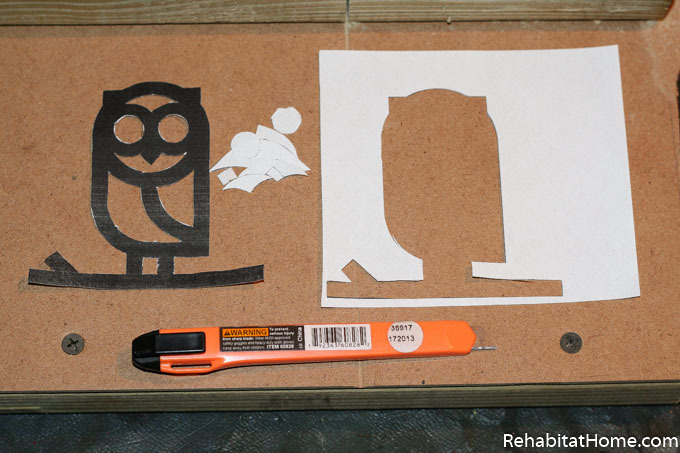 To transfer the animal shape to the wood, first cut out the silhouette. I used a cheapo razor blade from Harbor Freight, but any box blade or Xacto knife will work. Be sure to remove the waste completely and go back a second time to remove any stray paper fibers or odd edges. My goal is to provide perfectly clear lines for my saw blade to follow. Sitting at the scroll saw I’ll be spinning the workpiece around and around and around and I do NOT want to have to be making interpretations about whether that shape is a leg or an error in my tracing. That is how three-legged cat toys happen. Please be very careful when using a razor blade to cut out these shapes, especially if you have little ones helping you or bleed easily. Fun fact: blood readily penetrates wood grain and can be very hard to remove. 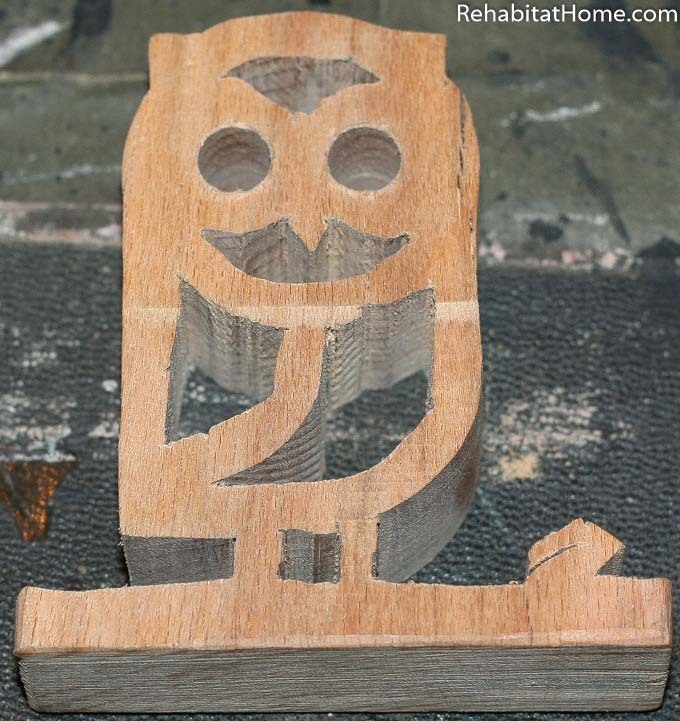 Laying the silhouette directly on the wood, use a thick pencil to trace the animal shape onto the workpiece. I like to use chunky, rectangular carpenter pencils because I get to sharpen them with my box knife (see fun fact above). Pointy corners and other detail areas need extra attention during this step to get sharp edges in the final product. Shade in the scrap pieces to clearly label the sections needing removal. If possible, try to orient the workpiece so that any less sightly portions are in the scrap area and won’t be part of the final wood toy. Now is also a good time to name your animal toy so the introduction to your kid isn’t so awkward. Just kidding, that would be weird. 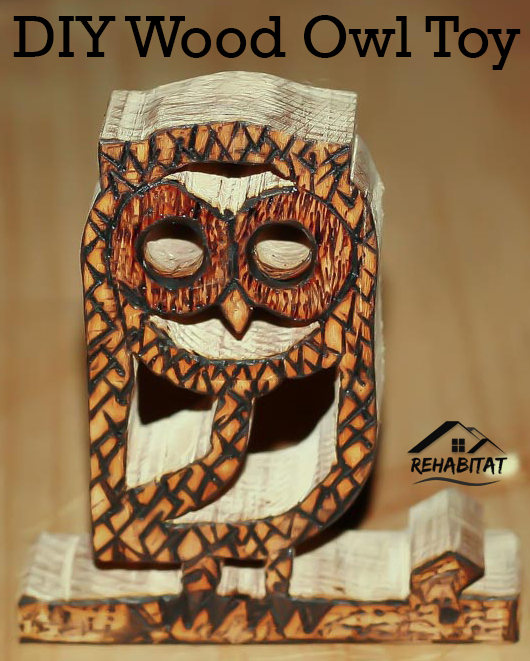 Cutting out the scrap wood is the easiest step, provided the animal shape was accurately transferred to the wood and sobriety has not been compromised. Removing the scrap takes place in two steps: drilling a hole in each internal section of scrap -and- cutting away the remaining scrap with a saw. To facilitate removal of scrap from internal sections, a hole must first be made to allow a saw blade to be threaded through. Hole placement needs to be as accurate as possible when drilling out eyes and other circular geometries. Holes to serve as saw passages can be placed anywhere in each scrap section, although placing them in the center of the scrap works best for me. 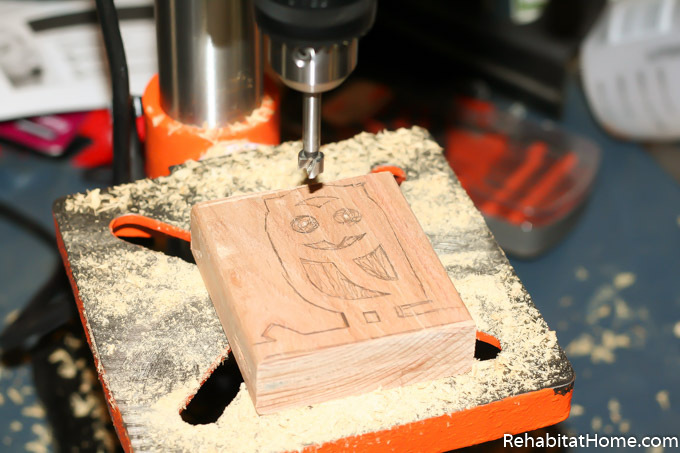 Drilling can be accomplished with a drill press, electric drill or hand drill. All that matters is that the bit is large enough to accommodate whichever saw blade is being used. For this project I used Wen drill press 4208 which we reviewed here. The next step is to remove all pieces of wood that will not be part of the final animal toy. Keep a steady eye on the saw blade as it travels down the pencil lines and go as slowly as you need to; use a fan or vacuum to remove any sawdust that may obscure your view. 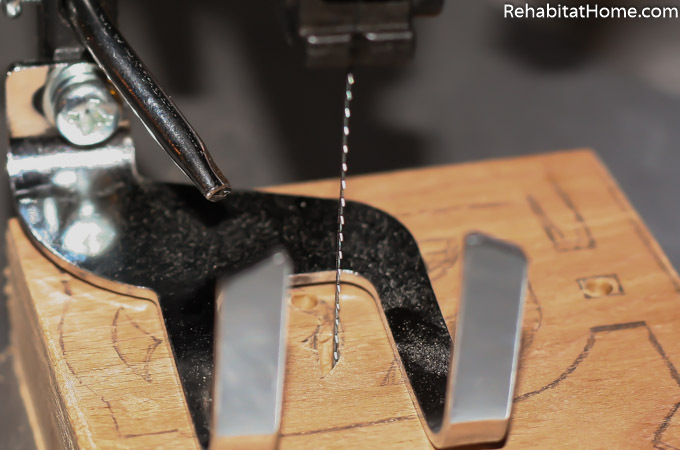 Sawing can be accomplished with a coping saw, fret saw, or scroll saw. If you aren’t familiar with these types of saws you may be surprised to observe that they produce a bowed cut and that wood is more slowly removed from the middle of the workpiece than from the top where your lines are traced. This is normal, just release the pressure your putting on the workpiece as the saw blade approaches a stopping point to allow the middle to catch up. 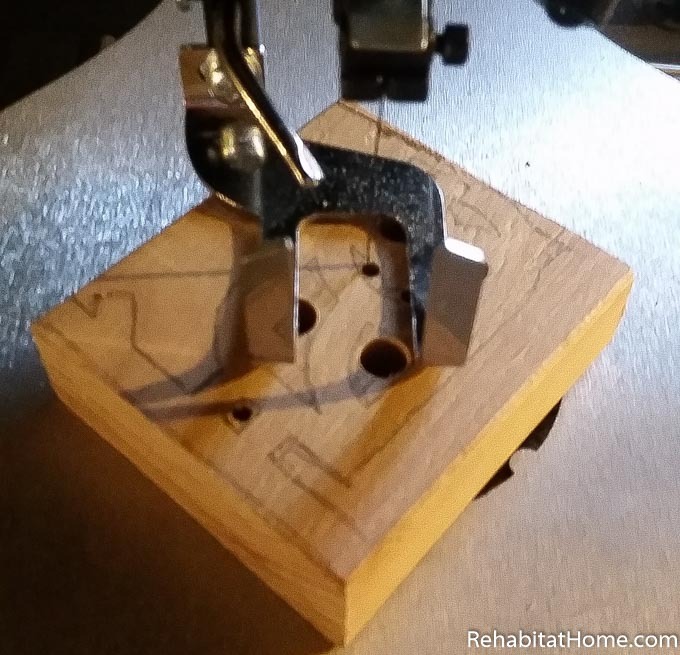 For this project I used Wen scroll saw 3920 which we reviewed here. Congratulations! You’re almost done. Now that your wood animal toy has been liberated from it’s cage of scrap, it’s time to clean him/her up a bit. Finishing is three short easy steps: sanding down rough edges left by the saw and smoothing the surfaces, burning design details into the wood and finally applying some protective wax. My scroll saw does not leave clean edges as it chews through wood, quite the opposite. Looking closely, you’ll notice that it leaves unsightly ridges of curled wood grain. Not very child-friendly. There are also some lines and gouges in the wood surface. While most children would think nothing of them, you’ll notice them ever time you see them and will wish you’d cleaned them up. So let’s do just that. To clean up the surface, start with rough grit sandpaper and use progressively finer grits until you’re happy with the appearance. If you’re using thicker wood you can safely sand off quite a bit of material eradicate any low spots. To round over the edges I primarily use medium-grit sandpaper and I keep some mini-files handy to get into tight corners. If you’re wood animal toy needs a bit of touching up to clean up some lines or rough edges you only really need to sand enough to get the top surface, don’t spend a lot of time sanding the interior surfaces since they’ll be mostly out of sight. At this point you may decide that your toy needs nothing more than some paint or wax. This was not the case with Octavio the owl. No, Octavio needed something to distract from his dented brow and his crooked beak and his atrophied left leg. He needed to be burned a little. Now, before we get ahead of ourselves, a pyrography iron is a fancy name for the soldering iron I bought from Walmart for $9.98. It’s so-so at melting solder but surprisingly effective at burning wood. Yes, you can buy nice ones but you could also probably use a lighter and a spoon and get roughly the same effect. Octavio’s details were added freehand and without much thought to the final product. 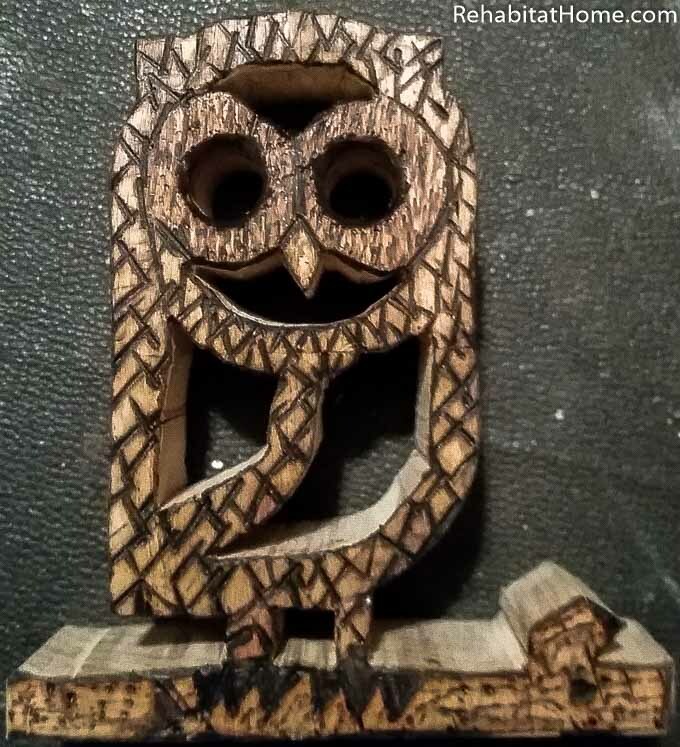 Use your judgement as how to best detail your particular wood animal toy. Be sure to use the flat tip of the iron to darken up the corners and edges. I noticed that this extra step really provided nice contrast and also improved the sense of shape of the toy. Rub on a layer of paste wax to provide some depth and sheen. At this step I noticed a lot of the details gained depth and the lighter areas showed more brightly. It also added some life to his cold, dead eyes and drew the eyes to his talons…and distracted from the brow/beak/leg issues mentioned above. If you’re concerned about little ones putting these or any DIY animal wood toy in their mouths, there are several food-safe finishes available. Personally, I’d be more concerned about whether or not you used a piece of formaldehyde-soaked pallet wood for your workpiece. With that said, Carnuba and Bee’s wax both provide a natural degree of waterproofing and protection. Did you enjoy this article? 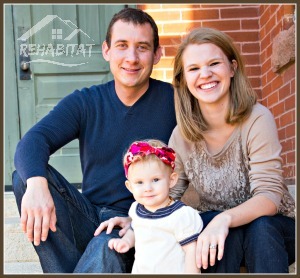 Click on the subscribe button to get monthly updates with all our projects. Have you built any DIY wood animal toys you’d like to brag about? Leave a comment and let’s compare notes.